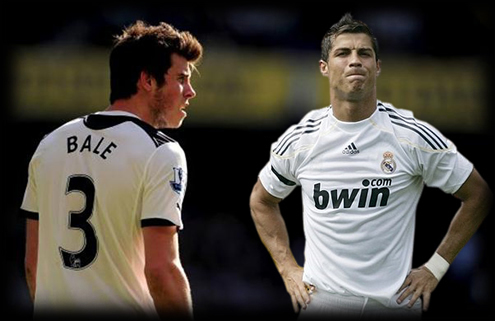 01.04.2011 » Gareth Bale: "I'm still not near of Cristiano Ronaldo level yet"
Tottenham's star, Gareth Bale, assumed that he's still far from Cristiano Ronaldo and Lionel Messi levels. The Welsh player revealed his humble side and said that the best thing any player can do, is to aspire reaching CR7 or Messi quality someday. Gareth Bale, Tottenham's biggest star of the moment and one of the world's most promising players, granted an interview today and reckonized that he's still not a football superstar unlike his future opponent in the UEFA Champions League, Cristiano Ronaldo. The Welsh player has been performing at a very high level throughout this season and there have been plenty of rumors indicating a big transfer in the summer, with plenty of top clubs interested, Real Madrid being one of them. However, all the fame and spotlights don't seem to fool Gareth Bale, since he thinks he can't be put into the same class of players as Cristiano Ronaldo or Lionel Messi. Bale: "I'm still young and still learning, but if you look at the likes of Messi and Cristiano Ronaldo, then those are the levels you have to aspire to. It's very nice that people have said nice things about me, but to be honest I try to ignore it. If you tell me I'm a superstar, I certainly don't think of myself in that way, to be honest. I'm more concerned about what is still to come, and I believe there is a lot more. I know I have to learn, so it is a case of working hard in training and in games. What have I still got to improve? Or what haven't I? There's a lot, far too much to explain." Gareth Bale is also recovering from an injury, just like CR7, and both players are expected to be fit for this Tuesday match in UEFA Champions League quarter finals 1st leg, to be played in the Santiago Bernabéu. The 21 years old left-sided star then added that his best moment this season, was undoubtfully the night in San Siro, when Tottenham managed to beat Inter in the UEFA Champions League stage groups and Gareth Bale scored an hattrick. 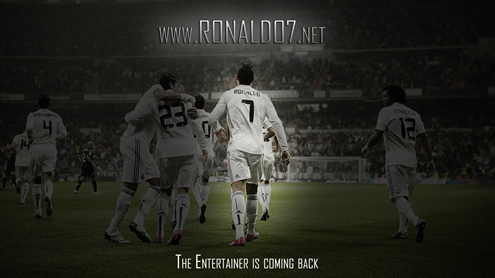 "I suppose the hattrick against Inter and then beating them at home have been the top moment of the season so far." It was then time for Gareth Bale to leave a warning to Cristiano Ronaldo and Real Madrid: "Hopefully my best moment is yet to come..."
Don't forget that you can watch Real Madrid vs Sporting Gijon livestreams, online here on ronaldo7.net tomorrow, but Cristiano Ronaldo won't play.